fun family BBQ with tennis, volleyball, horseshoes and lots of food! I shared my favorite dessert that's always a hit at get-togethers on Instagram. and stain our deck black. see a before of the deck here, too. great in the evenings, I found it and the taxidermy at Homegoods. wood color stain. We haven't noticed that it's hotter than what we previously had. let you know next year. Arborcoat Semi-Solid Stain - Black and Arborcoat Protective Clear Coat. stain per manufacturer's instructions and one coat of the protective clear coat. Here a few items that may be an issue if you're considering black stain. As you can see debris from our trees lodges between the boards. a good option, as ours was rough and splintered here and there. determined, we'll let you know how it holds up. are both sharing on the Tour through Blogland today. It looks gorgeous.....but I wouldn't want to have to deal with the maintenance! Maybe you could put down one of those outdoor area rugs to cut down on the paw prints. It looks amazing! Love the craigslist find too! Wow Pam, it looks just as good as I knew it would! I'm totally dying over your new purchase...It's amazing! I've been searching for something new for outside lately too! i love it! and that awesome craigslist score! hello. This looks great! Also, you have the best craigslist luck. I love the rattan set you found. Very sharp I really like it!! 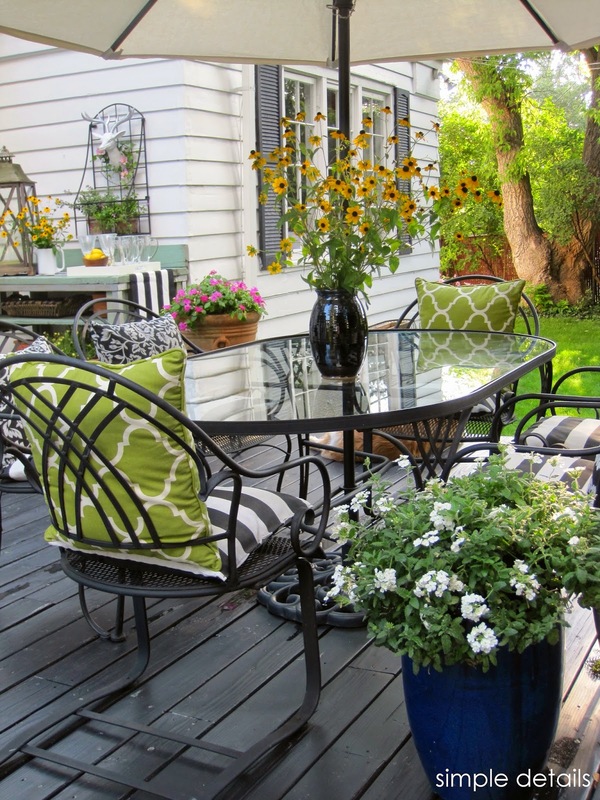 I love the look of your deck but I know what you are saying with dark versus light!! We stained our floors dark inside and it is definately more maintanance. I do love them though! I love your deck stained black. We stained ours black a few years ago, but we eventually had to go over it with Rustoleum Restore. I wish you much better luck. It could be the product we used though. We used Behr stain. I'm sure BM is much better quality. 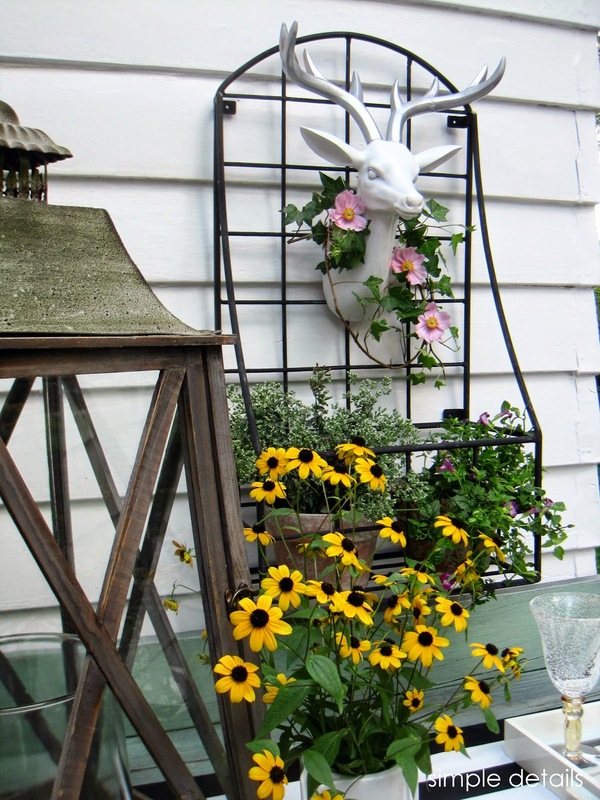 Love your potting bench and your new patio furniture. I must remember to check Craigslist often. Pam I LOVE the way your deck looks stained black!! 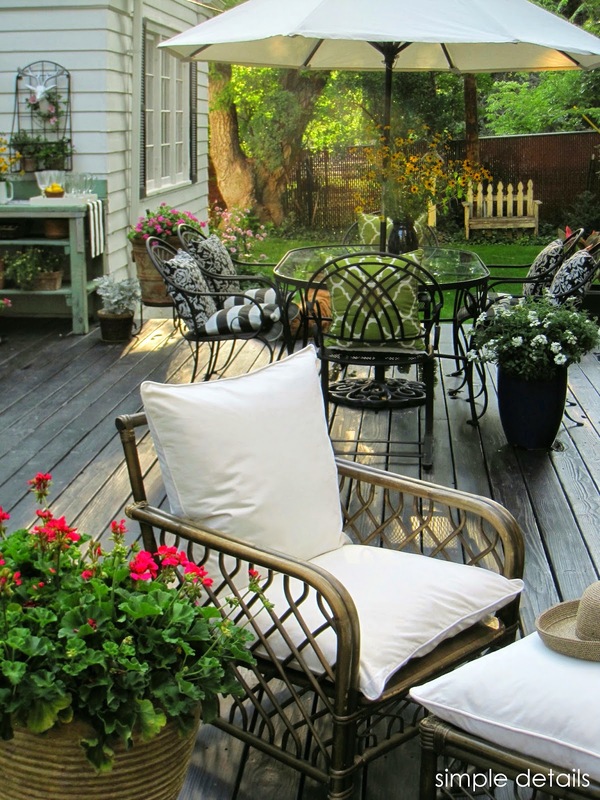 Everything about your deck is so pretty!! Hi Pam! Your deck looks great.. love the black but I can see you what you mean regarding what settles between the wood pieces and the scratching. It's always a tough decision when you consider decks and floor finishes. The composite wood for the outside is popular around our neck of the woods. You can get any color and finish and it seems to be require less maintenance. Hope your kids have a great start to a new school year. I always looked forward to getting back into the routine. We are 2/3 the way finished with the house .. it's been so much more than I thought it would be and there is no way I can focus on much else. Hope to be back in blogland in a few weeks. I was just wondering the other day when we were going to get a glimpse at your deck?! I think it turned out beautiful. Your deck looks great! We desperately need to stain the decking around our pool but it just hasn't happened yet. I do believe it will be up to me as Chris will be out of commission due to an upcoming surgery. Your new rattan furniture is gorgeous as well!! have a great week!! It looks great! I love your stain choice! Pam, another fantastic score on CL. 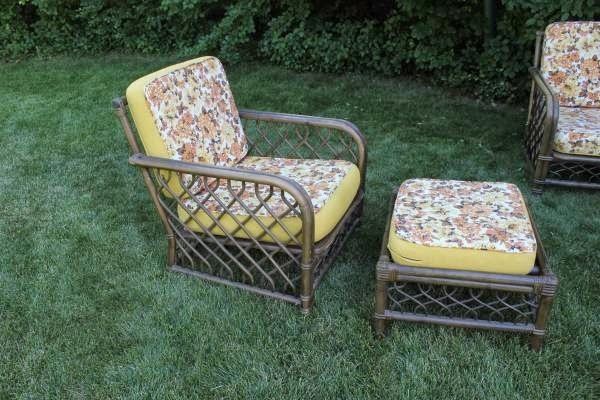 The rattan patio set is A-M-A-Z-I-N-G! You have to be one of the luckiest people in the world with your great scores. Either that or we need to move to Denver. Your deck looks great as everything you touch always does. Your incredible talent never ceases to amaze me. You are one great designer and I love everything you do and won't miss your blog. Our yard is crazy with the bajjilionty trees, but I love it in yours! Ah.. black. So chic. I absolutely love it!!!! 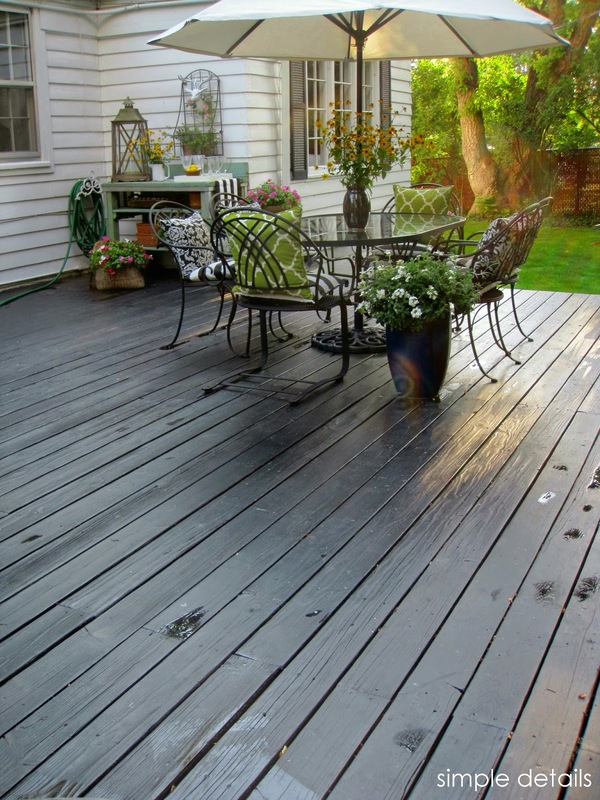 Now the deck floors go well with the rest of the black exterior of your home! 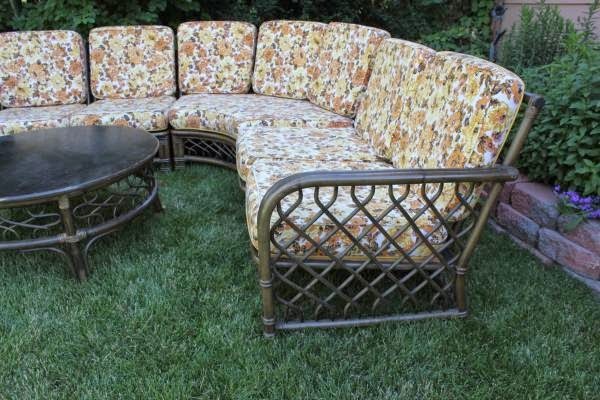 Love the set you found too,and yeah, reupholstering it would be a better option since outdoor cushions are way too expensive, but then again, it is end of the season, so you might find bargains out there. 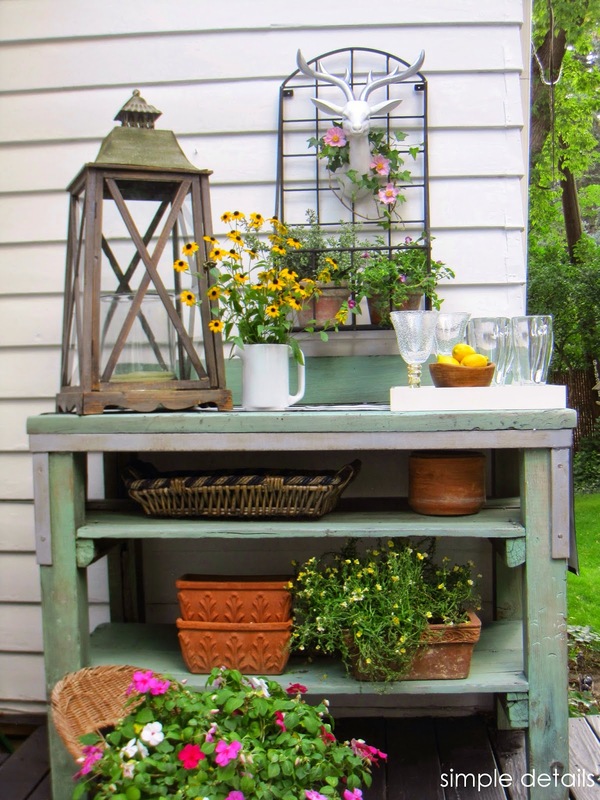 Love the vignettes on your potting bench too! Can't blame you for spending your time outdoors!!!!!! I love, love, love how it looks Pam! We need to refinish our back deck and using black isn't something that was even on my radar until now. And can we talk about how beautiful it looks with your pillows, flowers, and other accessories? The perfect place for hanging out on summer evenings! I love it black, it came out great Pam! Looks so beautiful with your white house & black shutters, and your pretty yard! Your deck is soooo pretty! I love the dark stain and I love your new furniture! But aren't you worried about it being out in the weather? I think the deck looks so stunning against the walls of your home...such a very classic look...you certainly can bring the elegance outdoors too!!! I love the black on the deck. Black always looks classic. Great Craigslist score! Did you post a follow-up on how the stain lasted over the winter. We are getting ready for our annual deck staining...somehow the winters in Chicago (wet or dry) cause peeling every spring. We currently use a dark brown stain (to go with tudor details on the house) but I'd love to switch to black. I've started using indoor/outdoor rugs to protect little feet from the heat during the hot days. Hi Anna, It's been almost three years since staining the deck, and although we still love it, it didn't last as long as we were hoping. After a couple years it needed touched up, we have harsh summer sun and Colorado winters. I don't necessarily think it was the stain, over the years we've tried several different high end products and despite the promises, they all seem to perform the same, needing re-coating after a couple years. Good luck with your choice!